The Star Trek actress, Nichelle Nichols, shown here in 1977, was employed by NASA to recruit new astronauts into the late 1980s. In this historical photo from the U.S. space agency, Actress Nichelle Nichols, who was born in Robbins, Illinois on December 29, 1936, is shown. She played Lieutenant Uhura the Communications Officer on the U.S.S. Enterprise in the original series, Star Trek. Nichols stayed with the show and has appeared in six Star Trek movies. 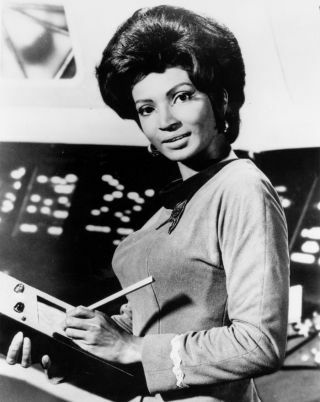 Her portrayal of Uhura on Star Trek marked one of the first non-stereotypical roles assigned to an African-American actress. She also provided the voice for Lt. Uhura on the Star Trek animated series in 1974-75. Before joining the crew on Star Trek, she sang and danced with Duke Ellington's band. Nichols was always interested in space travel. She flew aboard the C-141 Astronomy Observatory, which analyzed the atmospheres of Mars and Saturn on an eight hour, high altitude mission. From the late 1970's until the late 1980's, NASA employed Nichelle Nichols to recruit new astronaut candidates. Many of her new recruits were women or members of racial and ethnic minorities, including Guion Bluford (the first African-American astronaut), Sally Ride (the first female American astronaut), Judith Resnik (one of the original set of female astronauts, who perished during the launch of the Challenger on January 28, 1986), and Ronald McNair (the second African-American astronaut, and another victim of the Challenger accident). Currently Nichelle Nichols is actively involved in movies and special appearances. She is also a spokesperson for her favorite charity, "The Kwanzaa Foundation."